Deadpool 2 added Josh Brolin's Cable to its movie universe... but what if it recast the future Wolverine at the same time? Not the version of Logan that fans know from the current X-Men movies, played by Hugh Jackman, but one pulled from a comic book story far closer in spirit to the time-travel/world-saving plot of the Deadpool brand. 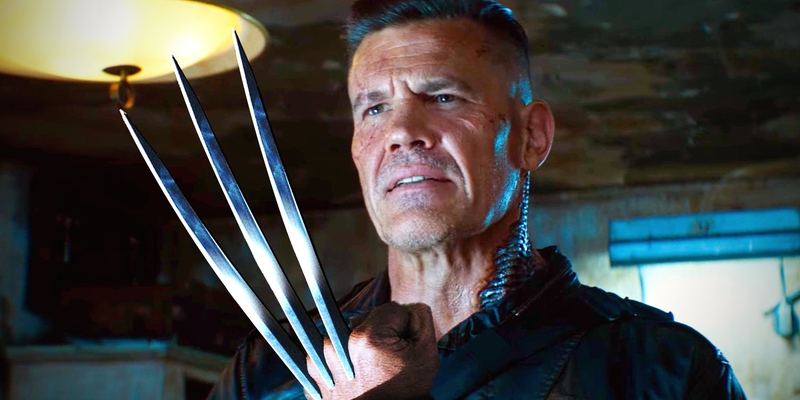 Even with Josh Brolin playing both Thanos and Cable, his grizzly performance will convince fans that Brolin would have - or could still - make the perfect Wolverine, Batman.. or any of the other roles fans have suggested in the past. But we've got a theory that Fox has already made that wish come true: introducing a new Wolverine, played by Brolin, pulled from the distant future. Sure, he's still going by the name "Cable" for now. But the movie supports the theory that this isn't the version of Cable everyone expected. And if Fox plays their cards right (or Marvel, should the X-Men rights join the MCU), this future Wolverine-Cable could finally push the X-Men series to new heights. Trust us, the pieces are more in place than ever before. It might seem like a crazy idea for Deadpool 2's Cable to be Logan; Hugh Jackman is done playing Wolverine, and a new, younger version of the hero is going to be recast (which means casting the much older version leaves wiggle room while still enjoying Logan's strengths). But in the actual Marvel Comics fiction, the future superhero known as 'Cable' actually was an older, cyber-eyed, metal-armed Wolverine. That's how it happened in the Ultimate universe, the parallel reality that has influenced the designs and stories of both the X-Men and MCU so far. And for those who know the story of that Wolverine-Cable, you could argue that the version in Deadpool 2 falls an awful lot closer than to the original Cable, son of Cyclops and Jean Grey's clone. And believe us, the similarities are more than just skin deep. This version of Cable obviously looks the part for the movie, but even Brolin's characterization resembles an older take on Logan. The chip on the shoulder for a wife and child lost, the biting sense of humor, and unapologetically emotionless demeanor (giving way to real heart) are all echoes of Logan's comic history. And no, the lack of claws in Deadpool 2 doesn't mean anything - in his Ultimate X-Men debut, Cable explained he rarely pops the claws anymore. He instead relies on his knowledge of the future, arriving in the modern day to kill an innocent mutant before they can ruin the world. Sound familiar? But the fact that the Wolverine-Cable's dialogue and Brolin's movie lines could be swapped without issue is just the start of the evidence. Don't get us wrong, the Cable in Deadpool 2 is equal parts formidable and badass... but he's still a long way short of the Cable in the comics. For starters, as the movie jokes, he's nowhere near as physically large as the almost 7-foot-tall Cable. Deadpool calls out this break from the comics due to Brolin's 5'11" height. Which, coincidentally, is right around the size and build of Wolverine if we're talking comic book lore. But the techno-organic virus which turns half of Cable's body to metal also grants him superstrength on almost unparalleled levels. Not only can he move faster than speedsters, he can lift tons and strike with the same force. He's also nearly invulnerable. So to see him matched and even bested by Wade Wilson, and punctured with a pen by Russell alone shows he's nowhere near the hero of the comics. Then there's the issue of his most iconic superpowers... none of which Cable has in Deadpool 2. As the child of Scott Summers and Jean Grey, Cable is an "Omega-Level Mutant," one of the most powerful to have ever existed. He has psychic powers to read minds around the world, glimpse the future, and form psionic shields and attacks that could cripple even resilient enemies. He's also telekinetic, able to move himself, allies, and enemies in defiance of physics or gravity. Oh, and his eye allows him to sense mutants and their powers psychically. He's overpowered, sure. But the Cable seen in Deadpool 2 isn't just a powered-down version... he shares little in common with the comic character's actual power set or abilities. Instead, it seems that Cable has had his arm and body parts replaced with cybernetic upgrades, able to launch gadgets, tap into computer systems, and rely on enhanced strength and combat skills to fight. And a metal skeleton to survive devastating impacts. Simply put, the Deadpool 2 Cable acts like a Wolverine who has lost his healing ability, and relies on weapons, durability, and an upgraded arm to complete his mission. That's the future Wolverine version from top to bottom. But it's Cable's actual mission that gets our hopes up. Not only does it match the Wolverine-Cable's goal, but could lead to an epic X-Men crossover that's been building for years.